I add a special fiddle part that complements other compositions, whether both lyrical and musical or simply instrumental. Country music is often established through a sense of “family tradition.” This deep-rooted awareness of musical heritage holds especially true for artist Brian Arrowood. Growing up in the foothills region of the Blue Ridge Mountains of Western North Carolina, Brian Arrowood played music alongside his cousin Andy and his grandfather Paul Birchfield, better known as “Grampsy.” With Brian on fiddle, Andy on mandolin, and Grampsy on guitar, people knew to call "The Mountain Musicians" if they were in need of some good ole time toe-tappin’ music. Brian developed these musical roots deep in the Appalachian soil and now shares his talents with audiences on some of the most impressive stages a musician could hope to play. Born in Asheville, Brian Arrowood grew up not far from there in the small town of Marion, North Carolina. Under the guidance of Grampsy, Brian competed at fiddlers conventions throughout the Southeast. He first won top title in a competition while participating in a contest in Mooresville, North Carolina and went on to earn additional titles of public recognition, including Fiddler of the Festival at Union Grove and later the three-time Georgia Mountain Fiddle King in Hiawassee. 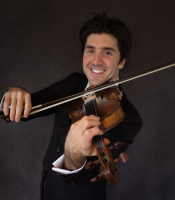 While Brian gained many well-deserved accolades for his fiddle playing, his musical skills are quite diverse. His training in the Suzuki Violin Method proved to be helpful while performing in the symphony at the Governor's School of North Carolina in 1997. Brian’s improvisational techniques were required when he became the first player of a stringed instrument in the East Carolina University Jazz Ensemble A. In addition to the violin, Brian plays mandolin and acoustic guitar, abilities he demonstrates regularly while on tour. Brian's continued focus on musical growth throughout his high school and college years eventually led him to a professional music career starting at Dollywood. Spending several years in Pigeon Forge, Brian performed at popular shows such as Country Tonite Theatre and the Ole Smokey Hoedown. During this time, Brian also began recording at the well-known Big Mama's recording studio, and his very own home studio would later provide him the workspace to continue this contribution for over nine years. The many recordings and experiences gained through Chartbuster have only further demonstrated Brian's ability to play a diverse set of musical genres. A move to Nashville in 2004 offered new opportunities, and within months he was touring with Grammy Award-winning singer/songwriter Billy Dean. The Wrangler Tour with Billy Dean and Craig Morgan gave Brian the chance to perform at fairs and festivals across the country, including a memorable experience in Alaska. This tour also allowed Brian the honor to play his fiddle for audiences of the Grand Ole Opry and share the stage in a duel of fiddles alongside icon Charlie Daniels. In 2008, Brian embraced a chance to tour with fellow North Carolinian Matt Stillwell. Together, Brian and Matt would take part in the Academy of Country Music Awards and open for major acts such as Darius Rucker and Alan Jackson. The 2010 year marked the opportunity for Brian to begin touring with country music superstar Travis Tritt, and a mere two years later, Brian began providing fly-on entertaining services for Carnival Cruise Lines, frequently finding himself onboard ships headed towards the Cayman Islands, the Bahamas, and even Cozumel, Mexico. In 2016, Brian was presented with the honor of performing several shows with longtime singer/musician of the legendary band the Eagles, Timothy B. Schmit. Currently, the 2017 year welcomes more great opportunities to see Travis, Brian, and the rest of the Country Club band playing near you at various festivals, theaters, and stages across the United States and Canada.